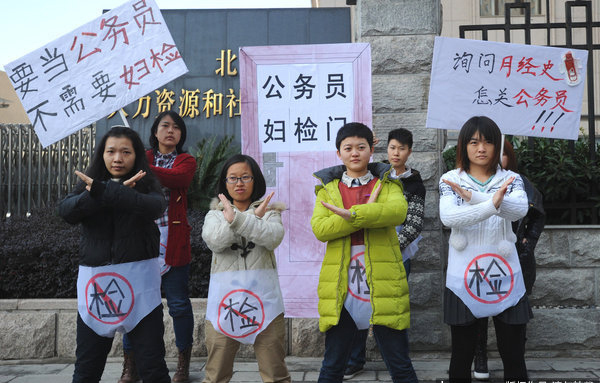 On November 26, female students in the Wuhan (Hubei) Provincial Human Resources and Social Security Department mounted a 'flash' demonstration to protest against the current mandatory female civil servant employment gynaecological medical checks. "This requires women not only to accept a vaginal speculum exam, but also answer questions such as the age of first menstruation cycle, amount of bleeding, the duration and so on. "We believe that the the entry examination program has nothing to do with the ability to perform in the civil service, and violates the privacy of citizens. We are therefore mounting a flash event to remind the relevant departments to get rid of the civil service gynecological entrance requirement," the organisers said. One student who participated in the "flash"said that according to the employment health check manual, the focus of the gynecological examination was to be for sexually transmitted diseases and malignancy, but normal work exposure does not cause the spread of STDs - and infections would not usually prevent a civil servant from properly fulfilling their duties. She also noted that STDs are best detected through blood tests not intimate examinations. Currently, Hubei Province, Human Resources and Social Security Department is yet to respond to the action of the students. A Zhongnan University Law School associate professor Lian Yungang said the imposition of gynecological examinations for female civil servants' employment checks could be seen as employment discrimination, and contrary to Equal Opportunity provisions of China's labor laws and employment regulations. The requirements because they appear lack of purpose, are not "appropriate" and exceed the "principle of proportionality" beyond a reasonable range, he added.